Long before airline pilots used St. Paul’s 12-foot high illuminated cross to find their way in the early days of aviation, our church in its various buildings helped guide the lives of our congregation of Methodists. Early settlers in Cedar Rapids gathered in the Listebarger cabin on the west bank of the Cedar River in 1840 to hear circuit riders preach. They formed as a congregation of Methodists in 1843. 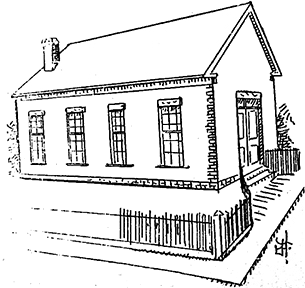 Several sources cite that the Listebarger cabin hosted the first meeting in Cedar Rapids of what would become the Methodist church. This cabin was located just north of the current Cooper’s Mill hotel on F Avenue NW. At this cabin, Methodist circuit riders including Rev. John Hodges and others met with area residents, preached sermons, led hymns, and performed marriages and baptisms. The cabin was constructed of logs covered with boards, and it served as the meetinghouse for St. Paul’s Church, the first church in Cedar Rapids. The first building constructed by the St. Paul’s congregation was a one-story brick structure built on land purchased from Judge George Greene, just southwest of the current Greene Square Park on the site that would later become the Union Station. On this site, the building known as the “Little Brick Church” was dedicated in 1856. 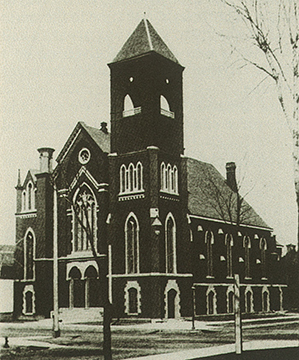 During the Civil War years (1863-1865) the congregation of St. Paul’s grew to 268, and the first full-time minister was appointed to serve it. The congregation looked for a location for a newer, larger church, and found it on the corner of Fourth Avenue and Fifth Street SE. This was the edge of town at the time. The congregation moved to the partially completed building, dedicating it in 1873. The financial panic of that era and the depression that followed delayed completion of the main auditorium of the building until 1878. This building would serve the congregation for 43 more years. One of America’s great architects, Louis Sullivan began his design work for the current St. Paul’s building in 1910. Sullivan is known as the “father of skyscrapers” and for popularizing the guiding concept “form follows function.” He moved American architecture away from classical and European influences by using ornamentation from nature rather copied from Greek and Roman designs. He was a mentor of another famed architect, Frank Lloyd Wright. Other Sullivan-designed buildings in Iowa include the People’s Bank building in Cedar Rapids and the Merchants National Bank in Grinnell. His Chicago buildings include the Auditorium Building and the Chicago Stock Exchange. 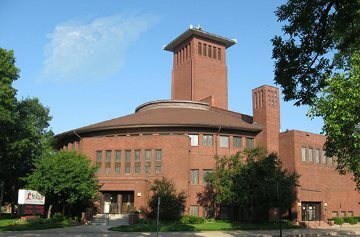 In 1913, St. Paul’s broke ground on construction for a new Louis Sullivan-designed building, a “modern church for a seven-day program.” Louis Sullivan’s original 1910 design included a gymnasium, highly organized Sunday school space, a dome of multicolored glass, and extensive exterior ornamentation. Its cost was twice what had been planned for, however, and rather than sacrifice his design, he withdrew from the project in 1912. The church hired a new architect, W. C. Jones, to finish the design work in a simplified form within a budget of $100,000. The new plan was called the Cedar Rapids Plan in which the “form follows function” concept was predominant. In 1914, St. Paul’s celebrated both the silver anniversary of the church’s founding and the dedication of this new building which has served us, with the addition of an education wing in 1953, to this present day. You’ll see our rich history in photo displays in the main hallway of the church. More of our history can be found in the recently published book "St. Paul’s United Methodist Church, the First 175 Years" and in "A Brief History - St. Paul’s United Methodist Church 1840-1990." Now, we move to the next exciting stage of our congregation’s history with the Forward in Faith Phase 1 building project. This 2016-17 project will help us do God’s work for the next 175 years and beyond.